Now that the warm weather has finally arrived we're feeling optimistic, if not a little tired of rising gas prices. 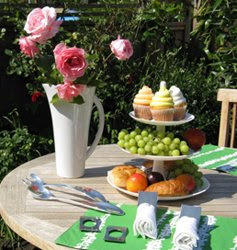 We’re planning for lots of get-togethers in the great outdoors - at home. All you need is a grill, a patch of grass or deck and get ready for some summer fun! Here are five top tips to help make summer entertaining a breeze. White serving dishes and dinnerware always looks appropriate and pairs well with any food. Go for the easy approach and stick to one-bite tapas-style foods - a napkin and fingers are all they need to nosh it up! For a quick, easy tapas recipe, try this unforgettable grilled asparagus. Preheat barbecue to high and lightly oil grill. Snap off woody ends of asparagus. Toss spears with olive oil, vinegar and pepper. Cut prosciutto slices in half crosswise. Wrap each spear with a piece of prosciutto, allowing ends to be exposed. Place on grill, close lid and cook about 1.5 minutes per side or until asparagus turns bright green and is tender-crisp. Dips with a selection of crackers, pita chips and crostini are always a hit - and easy. Serve your homous, spinach dip, tzatziki and even condiments in hollowed out red, orange, green or yellow bell peppers. Simply cut off the tops and stems and remove the sees from the inside of the pepper and fill these natural containers to the brim. Bonus: whole jars or containers of dips and condiments won't be ruined in the sun. Fresh blooms create instant elegance at any casual get-together and can be as easy as trimming a few stems from the garden. Display them in a central jug, pitcher or vase or go for the multiples option with a few glasses or bowls scattered around the table. Set a few blooms among a bowl of limes for an effortless summer-chic look. Everyone and everything looks lovely in candlelight so be sure to light up and transform your yard or deck into a twilight paradise! Choose from seasonal hurricanes, votives, tea lights, patio lanterns, torches, white Christmas lights or our own new clear plastic modular candle holder that allows you to stack a few up to create your own sculpture of light. For optimum flavour, be sure to protect white and red wine from direct sunlight. Keep white wine cool in pottery or stainless steel encasements and avoid decanting red wine in clear containers, use a ceramic pitcher instead. Cover with a napkin to discourage any wine-swilling insects. For more entertaining ideas, check out our selection of stylish servers and finishing touches - from our lovely white ceramic pitcher and 3-tier serving dish to our silver stackable napkin holders. And don't forget the kids! Our new line of uber cool, interchangeable Automoblox - a red sports car, purple SUV and green pick up truck - is sure to keep them entertained too!